Even the smallest of rooms and spaces can feel luxurious if everything is neatly organized. So where can you store your salon products, beauty supplies, and spa essentials? Check out our products bellow for storage solution ideas. 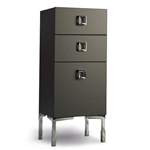 We offer an extensive variety of storage units and cabinets. Organize your salon or spa interior with hair stylist trolleys, carts with lockable doors, wood carts with drawers, durable stainless steel carts, carts on wheels, utility carts, Gamma & Bross trolleys, mobile carrying cases and more. Add style and design to you spa or salon by decluttering your life.